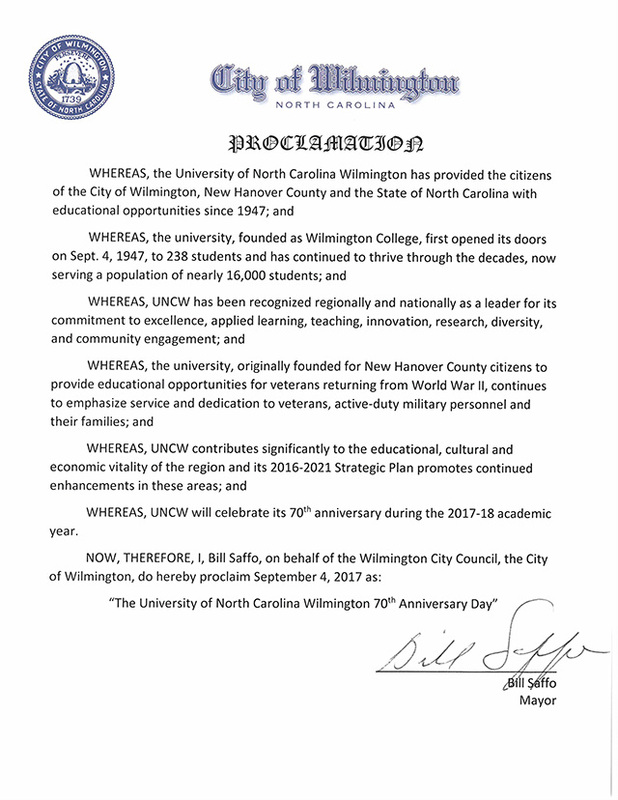 September 4, 2017, will go down in Wilmington history as “The University of North Carolina Wilmington 70th Anniversary Day.” Wilmington Mayor Bill Saffo '83 issued the official proclamation on Aug. 30 in recognition of the contributions that UNCW has made to the city’s quality of life since its founding as Wilmington College in 1947. Originally established as an educational center for veterans returning from World War II, the college first opened its doors on Sept. 4, 1947, to 238 students. By 1969, the college had grown significantly and that year joined the UNC system, changing its name to the University of North Carolina Wilmington. Today, UNCW serves a population of more than 16,000 students. As outlined in the proclamation, the university continues to emphasize service and dedication to veterans, active-duty military personnel and their families; contributes significantly to the educational, cultural and economic vitality of the region; and the achievements of the students, alumni, faculty and staff of UNCW inspire pride in the Wilmington community and beyond. UNCW will celebrate its 70th anniversary with a slate of events throughout the 2017-18 academic year.